While a love and appreciation for the sheer beauty of fine jewelry was definitely a draw to the profession, the most important factor in the jewelry business for Lynn and Barb Strauss has always been the people—their customers. As a result, they consider customer satisfaction their most important marker of success. Sharing the special moments of people’s lives, their weddings, anniversaries, and other remarkable occasions, is one of the best benefits of their work. Today, Strauss Jewelers has grown into the vision Barb and Lynn began with—an extraordinary jewelry store where long-lasting customer relationships and excellent customer service are the foundation for success. Lynn Strauss has been in the jewelry industry since 1965 and Barb since 1974. They met at the jewelry store where Barb was working and married in 1976. 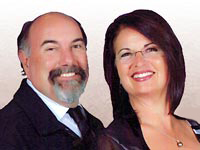 Barbara and Lynn purchased Deming Jeweler’s in downtown Mount Vernon, WA, in 1986, moving to their current location in 1994 and changing the name to Strauss Jewelers. They enjoy motorcycling, snow skiing, camping and volleyball (Barb). Lynn and Barb have three adult children and two grandchildren. Faith, family and friends are an integral part of their lives. Dan Wilson started working in the Jewelry industry in 1975. He joined the Strauss Jewelers team in 1994, and has enjoyed serving the greater Mount Vernon community ever since. Dan earned his Business Administration Degree from Whitworth College in Spokane, WA. During his off hours he enjoys long boarding (skateboard), mentoring youth, and camping and hiking with his family and friends. Dan was married in 1980. He and his wife Lori have three adult children and are proud grandparents. Faith and family are central in their lives.